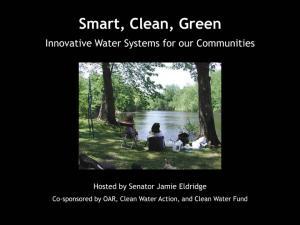 The forum, hosted by Senator Eldridge and co-sponsored by the OARS, Clean Water Action and Clean Water Fund on Saturday, March 13 attracted 75 participants from Westborough to Concord eager to learn about innovations in water management. "Our cities and towns are facing a water and wastewater crisis created by antiquated infrastructure and a failure to properly invest in maintaining existing infrastructure," said State Senator Jamie Eldridge. "It's an urgent problem that demands our attention, because the integrity of our water infrastructure system has a large impact on our public safety and our public health." The program, title slide of presentations, and press release are below. Please contact OARS if you would like us to email you a particular presentation or give a condensed presentation of this material to your group or club. Major Victory for Our Rivers!